Share the post "Album review – L.A. 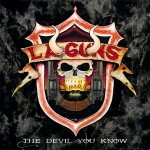 GUNS – The Devil You Know"
L.A. Guns are on a roll right now having just released their third album in two years. Following hot on the heels of 2017’s “The Missing Peace”, and last year’s live effort, new album “The Devil You Know” is more than a continuation of that, this is an album that is a link between the sounds of the band’s earlier albums and where they are now – a prime example of this is the album’s first single “Stay Away” which perfectly bridges the bands earlier material with their newer stuff. As you would expect, the album itself is packed with attitude and swagger and on this occasion the band’s influences are laid bare for all to see (or hear). “Loaded Bomb” has a very Led Zep style opening and could have fitted nicely on to any of L.A. Guns mid-career albums (I’m thinking “Vicious Circle” here) whilst the album’s title track “The Devil You Know” is a riff heavy, Black Sabbath like affair. Then we have “Going High”, this track really reminds me of mid 70’s Aerosmith and that is never a bad thing. The album opens with the fast paced and energetic “Rage”, almost bordering on punk, the band can clearly still pull it off. The tracks that are most typically L.A. Guns like are “Needle To The Bone” and “Gone Honey”, both of which remind you of the song writing quality the band have had throughout their career. “Down That Hole” is like no other song on the album and features a very fine vocal performance from Phil Lewis, “Another Season In Hell” is the albums slow one and showcases the heartache vocal that he does so well, it also has some stunning guitar work from partner in crime Tracii Guns. CD and digital versions of the album contain the bonus track “Boom”, nicely closing the album in style. This entry was posted in ALBUM REVIEWS, ALBUM REVIEWS (Mobile), All Posts and tagged album, classic rock, Frontiers, hard rock, L.A. Guns, Phil Lewis, review, sleaze, The Devil You Know, Tracii Guns. Bookmark the permalink.